In this article the potential of cooling lubricants (CL) for the machining of carbon- fiber reinforced plastics (CFRP) has been analyzed. The investigations were done during a collaborative research project of Blaser Swisslube AG and Fraunhofer IPA. On the one hand, a new CL was developed which follows overall considerations of the wet machining process. On the other hand, the usage of CL offers the chance to create a more efficient machining process. Therefore, the cutting principle was adjusted to the brittle fracture behavior of C- fibers combined with the CL. Due to CFRP milling tests with CL, it was possible to increase the feed rate by factor four compared to the dry process. Thereby, the machining quality was kept the same than in the dry process. Furthermore, it has been experimentally proven that hazardous dust, which occurs in dry machining, can almost completely be bound by CL. The overall objective was to reduce the production costs of CFRP components by an optimal aligned wet machining process. The achievable reduction in process time makes an important contribution for Supply Chain Management. 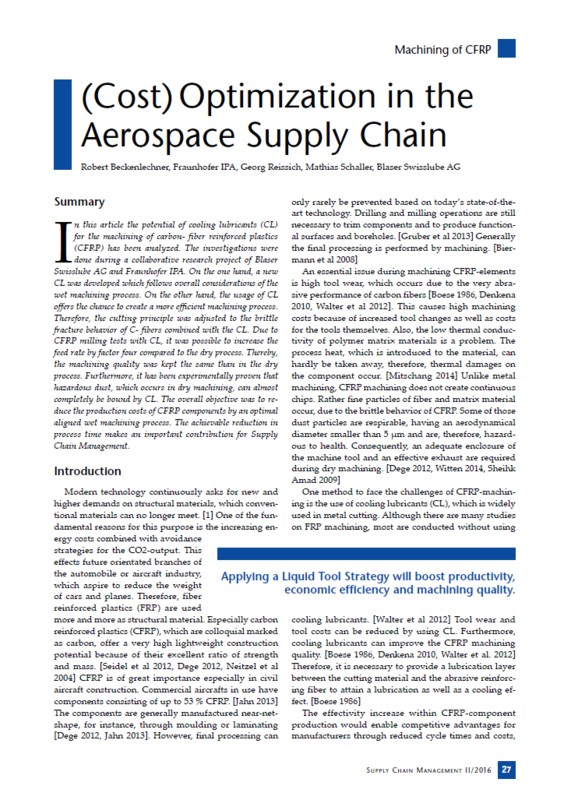 Older PostThe Digital Aerospace Supply Chain – a New Paradigm or Just a Fad?